Use this installation instruction. Or ask us to install it for you, we can do it free of charge. 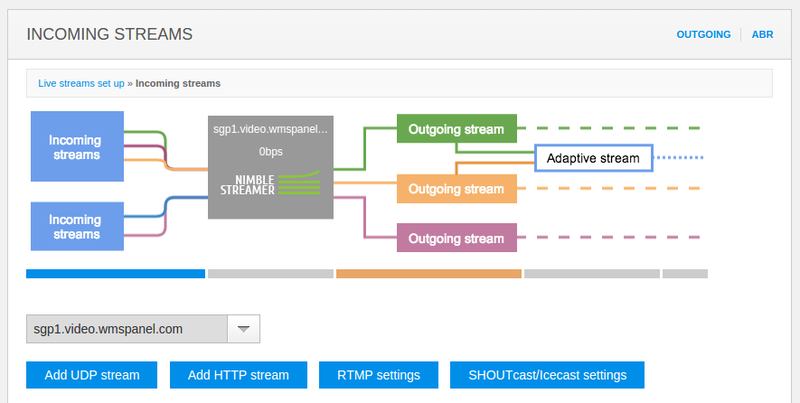 To take RTMP streams for transmuxing, you need to specify available sources. After that Nimble will pick them up and start producing HLS chunks for immediate use. Go to Nimble Streamer -> Live Streams Set Up menu to see list of available servers. Then choose a server to make settings. Most of actions may be applied to multiple servers at once so you can choose any of them. 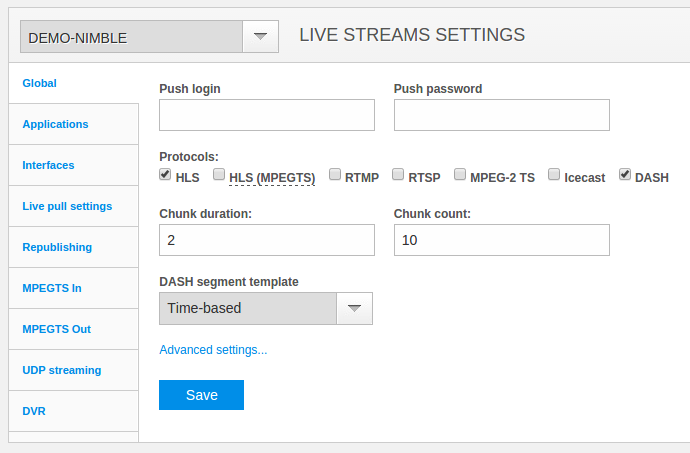 You may combine both scenarios and process both types of incoming streams to get both HLS and MPEG-DASH outgoing streams. Going into RTMP settings page, first you'll see several tabs. First one you need is Global. These are global server settings. These are as follows. Protocols which will be produced - you can generate all 4 supported types or just one of them, it does not affect the performance much. Push login and password for published streams - they will be used by default for published streams. You may also define individual applications' settings. Go to Applications tab to add new apps. Each app has the same set of fields as Global server settings. You may apply new application settings to several Nimble servers instances. Just click on their names' checkboxes in the dialog - the setting will be applied to each server within a few seconds. To make Nimble Streamer capable of getting published RTMP streams, it needs to listen to a specific interface - address and port. Go to Interfaces tab and click on Add interface. You'll see a dialog for specifying an address and a port to listen to. You may leave IP address blank, in this case Nimble will listen to all IP addresses available. You may also apply new settings to multiple servers to convenience of administration. 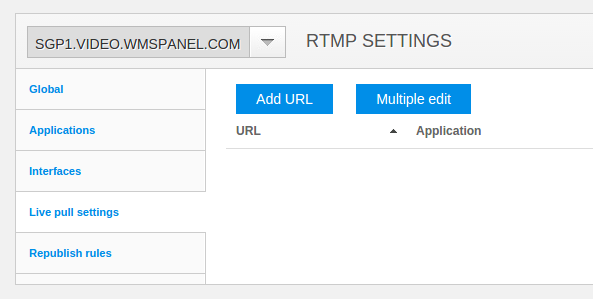 Adding new interface to process RTMP publishing. If you have only published streams, then you can move to step 3. 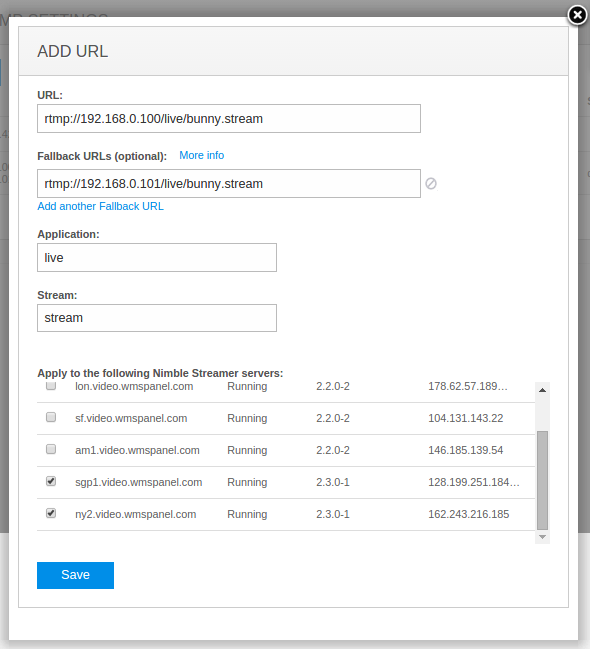 If your streaming content is available via available RTMP streams, you may pull them into Nimble instances for further transmuxing. To make proper settings, go to Live pull settings tab. URL - the address of RTMP stream. Fallback URLs - if you have multiple sources of the same stream, you may specify them to make robust streaming, so if main stream goes down, secondary streams could be used. Application and stream are the the names which will be used for DASH stream URL. As already mentioned in other settings, you may apply this setting to multiple servers - just click on their names' checkboxes. 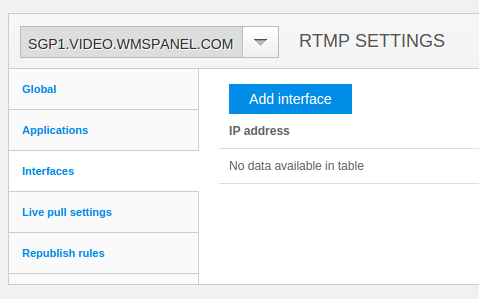 New pulled RTMP stream settings. Once it's saved, you'll see it in settings list. New stream in the list. 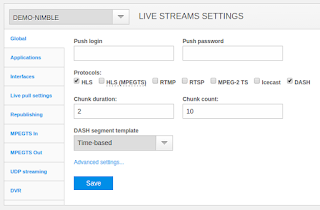 Having incoming streams defined and processed, you may now use the results of Nimble Streamer transmuxing for streaming your content via MPEG-DASH and any other protocol which you selected in global or application settings, e.g. HLS. link for getting playback URL - it's a question mark. To use the outgoing stream for playback, click on question mark icon to see Sample URL for player dialog. MPEG-DASH and HLS stream names. Here you see links for 2 protocols which you defined for this server in global settings - MPEG-DASH and HLS. Another feature set common across HLS and MPEG-DASH streaming is adaptive bitrate streaming. It allows you to give a stream containing sub-streams with different bitrates so a player or a viewer could select appropriate bitrate according to their network conditions. 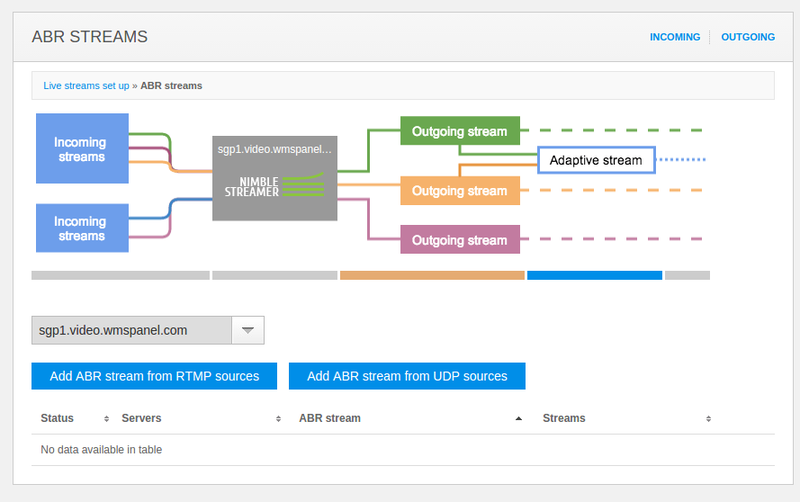 To define ABR streams, click on Adaptive stream area on a chart or ABR link on top. Click on Add ABR stream from RTMP sources button to see the following dialog. New ABR MPEG-DASH stream settings. ABR application name and stream name - they will be used for playback by your viewers. Source application name and stream name - you can add several sources from currently available single-bitrate streams. Just start typing names to see gestures listing available sources. As in other Nimble settings, you can select multiple servers to apply these settings to. 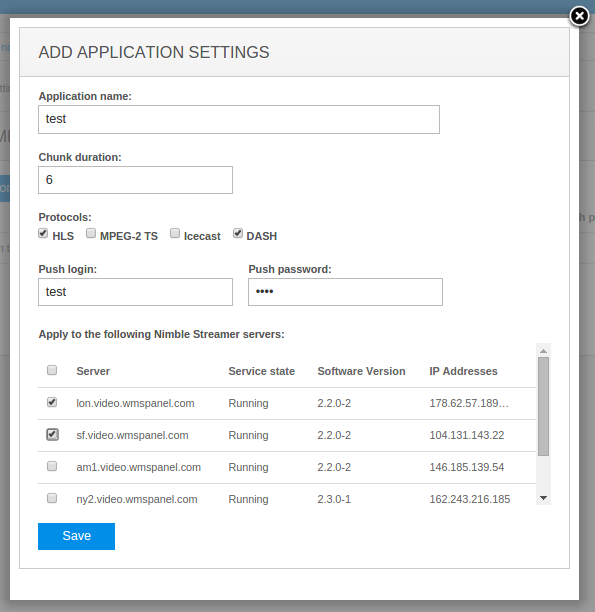 Thus you can specify ABR stream for your entire infrastructure. Having set up the stream, you will see it in the list. Once it's synced up, it'll be shown in "online" state. To start using it, click on question mark icon to see Sample URL for player dialog. URLs for MPEG-DASH and HLS ABR streams. Use these URLs for further playback in your DASH-capable or HLS-capable players as previously described on step 3. 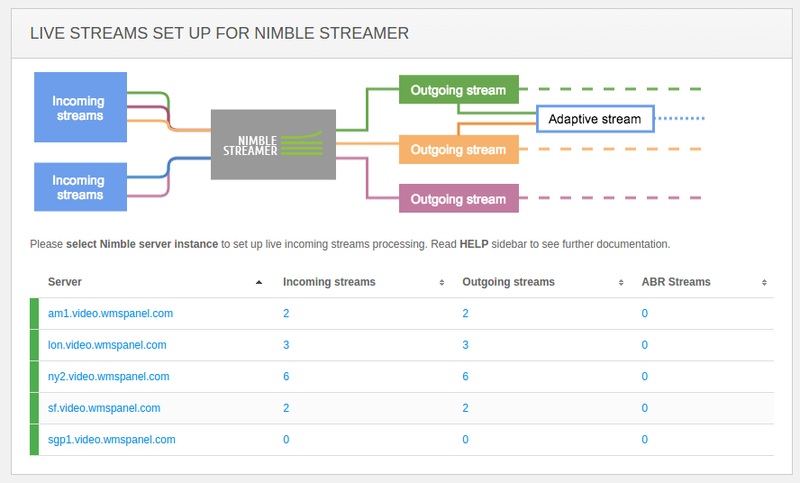 If you need to change content before transmuxing into ABR, use our Live Transcoder for Nimble Streamer to transform. It has high performance and low resource usage. 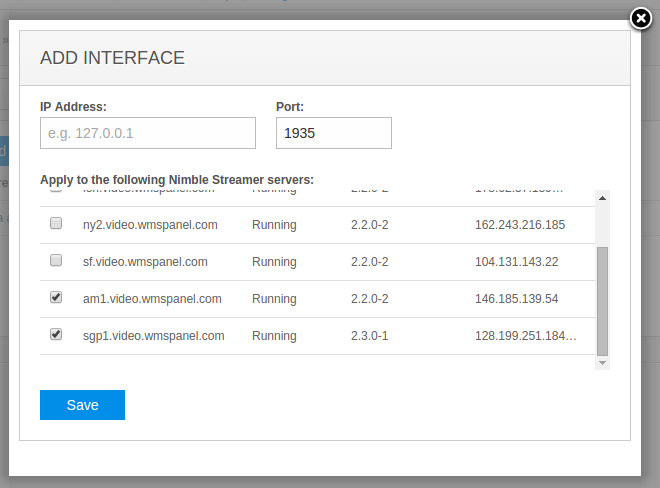 Using Nimble Streamer in your streaming infrastructure, you can get DASH streaming statistics via WMSPanel reporting SaaS. It has built-in support so you don't need to parse logs or anything like that - Nimble will send required metrics to central service for your convenience. WMSPanel is currently an associate member of DASH Industry Forum. We will extend DASH feature set with all scenarios available for HLS. This includes features like live streaming from MPEG-TS (both UDP and HTTP). Please contact us if you need to cover some specific use cases or if you just have any feedback about DASH handling in Nimble Streamer. does nimble streamer can be run on windows 10?? Yes, it can run any x64 Windows.